Laparoscopic surgery, also called minimally invasive surgery (MIS), is a modern surgical technique. Abdominal operations are performed through small one to two inch incisions, as compared to larger incisions needed in traditional surgical procedures. 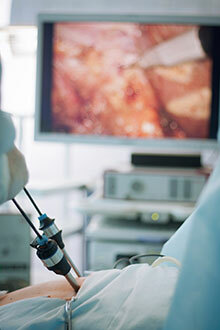 Laparoscopic surgery includes operations within the abdominal or pelvic cavities. There are a number of advantages to the patient with laparoscopic surgery versus an open procedure. These include reduced blood loss, smaller incisions, less pain, and shorter recovery time.